As researchers who have eyes only for predictive metrics, we appreciate having a real foundation of insights to help identify trends to help our clients beat the competition. So, for the past 31 years, Brand Keys has conducted a year-end examination of our validated loyalty and emotional engagement metrics, collected from over 100,000 consumers who participated in predictive surveys we conduct each year. That means we examine more than 150 B2B and B2C categories and nearly 1,000 brands. This provides Brand Keys with a correlated-to-behavior view of changes in category drivers, path-to-purchase values, consumer expectations, arrival, departure, and formation of category and customer values, as well as the percent-contribution these elements make to consumer engagement and brand profitability. Examined in aggregate, these assessments provide marketers with a leading-indicator trajectory of future trends marketers will have to address in the next 18 to 24 months. The eyes have it and increased consumer visual literacy will concurrently and dramatically increase the use and utility of emoticons. Using emoticons will help to create brand differentiation, make brands appear user-friendlier, and increase engagement, particularly in social media outreach. Awareness will be a given. Marketers will link “engagement” to how well brands are perceived versus their category’s Ideal, rather than relying on measures of entertainment like “likes,” tweets, or share counts. Brands will need to differentiate and stand for something meaningful, emotional, and important in the mind of the consumer. Otherwise – whether known or not – marketers will find themselves managing well-known commodities. Wearable device shipments have already increased 200% from last year and smart wearables will move from accessories focused on notifications to more advanced capabilities creating real opportunities for brands. A new twist on customization and personalization will become the new tradition. Consumers will seek out ready-made from brands able to create the look and feel of small-business, handmade, uniquely crafted products, services, and experiences. As consumer decision-making becomes more emotionally-based, successful brands will identify and utilize emotional values as foundations for meaningful positioning, differentiation, and authentic storytelling. The ability for brands to accurately measure real, unarticulated, and constantly expanding consumer expectations will provide significant advantages to engage, delight, and profit for brands that can. As more-and-more agile, hot-wired-to-mobile-device, culture-of-now consumers move faster and faster á la social marketing and outreach, brands will need to get faster too. After reaching out , 40% of consumers expect a brand response across a variety of social media platforms within an hour. Storytelling is fine, but the stories brands tell must reflect real brand values, category realities and, most importantly, the truth. Consumers have signaled increased preferences for traditional, value-driven brands, and have become more wary of brands that betray their trust. Just ask Volkswagen. Consumers will demand to be more inspired, more entertained, and more emotionally engaged by brands. Social media’s democratization of content creation will require that brands generate more immersive entertainment and increased virtual and augmented realities allow consumers to both participate – and shape – their own brand experiences. It’s said that a new year provides marketers and brands a chance for new resolutions and new beginnings. Also the chance to beat the hell out of the competition! But if you want to do something new, you have to stop doing something old. These 10 trends provide brands with an opportunity to break habits, embrace new methods of brand engagement, and introduce new business models, new technologies, and new and profitable opportunities. If we can help you put these trends to work for you, feel free to give us a call. In the meantime we wish you all an engaging and profitable 2016. A Soldier, a Sailor, an Airman, a Coast Guardsman, and a Marine found themselves at the Pearly Gates of Heaven. While they were waiting to be admitted they got into an argument about which branch of the service was the best. Sometime later the five servicemen ran into Saint Peter again and reminded him of the question they had asked when first entering Heaven, and if he was ever able to ask God for the answer to their question? 1. All branches of the United States Armed Forces are honorable and noble. 2. Each serves America well and with distinction in both war and peace. 3. Each branch of the armed services is comprised of patriots. 4. Serving in the United States military represents a great honor warranting special respect, tribute, and dedication from your fellow man. 5. Always be proud of that and honor all our veterans and their love of country. Tomorrow is Veterans Day, a celebration to honor America's veterans for their patriotism, love of country, and willingness to serve and sacrifice for the common good. We salute them all. 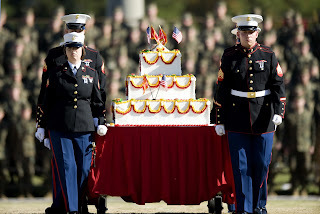 But today belongs to the United States Marines, on the 240th birthday of the Corps. This birthday presentation started November 1, 1921 by order of the 13th Commandant, Gen. John A. LeJeune, as a reminder of the service of the Corps and its inception. It’s been celebrated by Marines this way for 94 years and is a real tradition and part of its “long and illustrious history.” It’s a truly emotional event where loyalty and continuity reinforces the Marine Corps brand. Marines are proud of that history and our traditions. The Marine Corps tradition is part of the bedrock of this nation, and one of the constants that makes every American hopeful for the future. The Marine Corps’ voice is one of quiet power and reverence befitting an institution this country has looked to as its protector for more than two centuries. I didn’t write that last part, it’s a quote from the Marine Corps Brand Vision, which is pretty much a kind of back-to-the-future vision of who the Corps is. The Marine Corps motto – “Semper Fidelis” (“Ever faithful” and John Philip Sousa’s official march of the Marines) – was adopted in 1883. It replaced three traditional but unofficial slogans; Fortitudine” (“with courage”), “Per Mare, Per Terram” (“By sea and by land,” which was appropriate since Marines were once known as “soldiers of the sea,”) and, “To the shores of Tripoli,” revised in 1848 to “from the halls of Montezuma to the shores of Tripoli.” From a branding perspective, four taglines isn’t a bad record for a brand that’s 240 years old, particularly when you consider that Coca Cola and McDonalds have each had about 30 tag lines in this century alone! A lot of credit goes to ad man J. Walter Thompson for that. Mr. Thompson enlisted in the Marine Corps in 1864 so you might say there was some history there too, because about 100 years later his company helped develop the Marine Corps into the elite brand it stands for today. It is, perhaps, the most-cited slogan of any of the U.S military forces and even appears on Madison Avenue’s Advertising Walk of Fame. Traditionally, Marines meet up on November 10th to share a birthday meal or drink with some celebrations a bit more expansive than others. Take, for example, chef and restaurateur John Besh, who served in Desert Storm in the 1st Marine Division. He and his fellow Marines found talking about real food more satisfying than eating their MRE’s (Meals Ready to Eat, which are self-contained, individual food rations Marines use in combat areas where cooking facilities are not available. Older Marines will know them as K-RATS and I can assure you haute cuisine they are not!). His experience – and an adaptation to civilian life of small-unit Marine tactics – ultimately led to a large chain of twelve restaurants. And a coveted James Beard Award, and four cookbooks. Oh, and his small division, fire team, take-the-hill Marine training led to his setting up soup kitchens in New Orleans after Hurricane Katrina when they were needed most. The leadership that is borne in every Marine led to the creation of the John Besh Foundation, which protects and preserves the culinary heritage and indigenous foods of New Orleans and the Gulf Coast region through culinary scholarships and micro loans. Oorah! As a tribute and tradition to the institution and a thanks to those still serving today, John hosts an annual Marine Corps Birthday celebration at his restaurant, Lüke, in New Orleans. 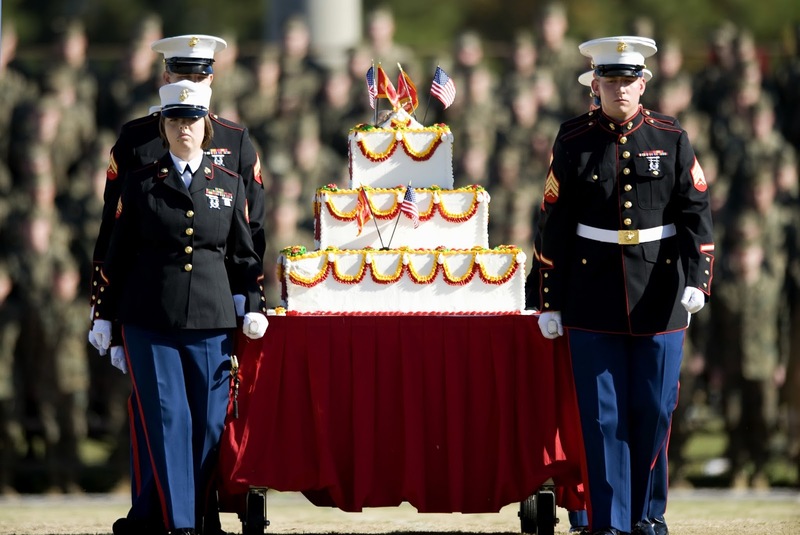 Last year nearly 1,700 celebrants showed up, further proof that Marines don’t fool around about how we celebrate things that are important to us! All Marines are welcome to eat and drink for free on the day the Corps was founded. Navy personnel are welcome too, because, as I am fond of pointing out the old joke, the Marines are a Department of the Navy. The Men’s Department! Who Uses Search & Which Search Engine Do They Use? With the holidays coming up there’s lots of chatter about how online and mobile price-checking and buying and comparing are making themselves felt in the retail arena. That’s as may well be, but in this year’s Brand Keys Loyalty Leaders List only one search engine showed up in the top-100 brands. In fact, only one other search engine showed up in the top-689 brands. Want to guess which brand was in the top-100? Don’t bother searching for that answer, it was Google. But you probably already guessed that. There was a time when names like Magellan, Infoseek, Lycos, Ask Jeeves, HotBot, and Alta Vista would have sprung to mind. Some might have even shown up on our Loyalty Leaders List, but not any more. We’ve reached a point where technological innovation has outpaced most competitive marketing. Like virtually every other category, the ability to meet or exceed consumer expectations for what drives a category ends up determining the life – and death – of brands. Just as it has for search engines. Category expectations are always set by the consumers who use a product or service, so we looked to see who’s using search engines. Well, on a typical day, 75-80% of adults use one. It’s a pretty even split between males and females, with men having a slightly higher usage rate than women. Younger people use search engines more than older folks, and there’s a high correlation between high degrees of usage and higher education and higher household income. Those numbers haven’t scared off innovators, though. They’re out there trying to build new search engines that can exceed new expectations for the new consumer values that are always making themselves felt in categories. NowRelevant keeps search down to just the past 2 weeks and DuckDuckGo doesn’t track or personalize search. And if you’re interested in what Facebook and LinkedIn are doing on the social side of things in the category, just paste this paragraph into the search box of your computer or mobile device! The search setting is always up to you.